May's training event will fall on the fifth Friday of the month and will meet in our usual training room at the Opportunity Center. 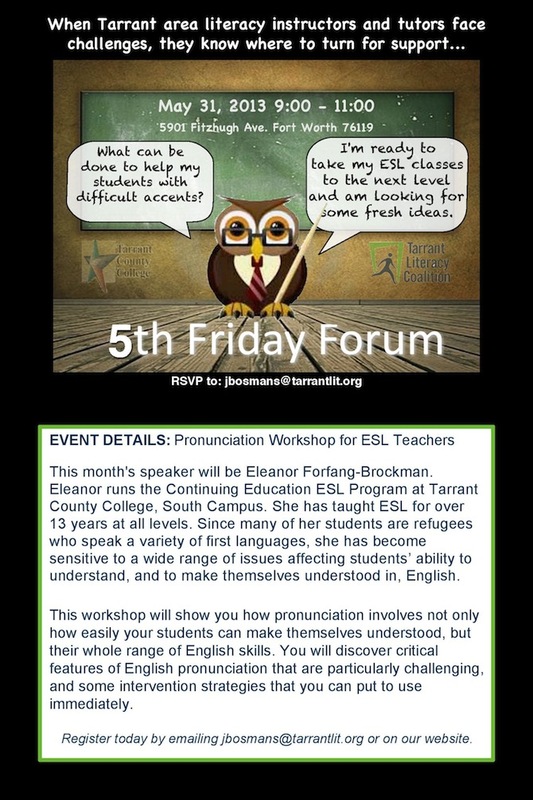 The presenter this month is Eleanor Forfang-Brockman, discussing strategies for advanced ESL topics including minimizing accents and addressing individual student needs. This training event is a must for any ESL instructor or volunteer and GED/ABE instructors with students whose first language isn't English. Tarrant Literacy Coalition conducts free community literacy training events monthly. Topics vary month to month but may cover topics such as volunteer training and recruitment, ESL programming, GED updates and programming, Computer literacy, barriers to learning, and best practices of adult education. RSVP by emailing jbosmans@tarrantlit.org or click here to register online.